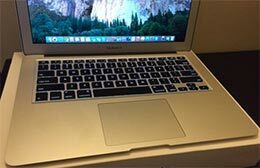 I need to start this Apple MacBook Air MJVE2LL/A review with a quick suggestion, if you are confused between choosing Macbook Pro or Macbook Air. Click to skip and read the review about this device too. 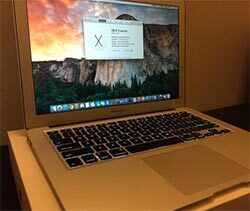 If you need a Macbook that you will use more as your primary device – or main computer, then I suggest you to look at Macbook Pro as it has more power / faster CPU and stronger GPU. But let me tell you, all Apple Macbooks come with dual core processors and not quad core, it means the difference is not much. The only big difference is, its CPU clocking speed and TDP. Wikipedia explains on TDP. Why Apple MacBook Air MJVE2LL/A? But if you want a laptop that is very light and thin, that you will use more as on the go device, then this MJVE2LL MacBook Air is your choice. The big points on Air are size, weight and battery life. I have been using Windows computer for 20 years, and I can tell you even if you find a better Ultrabooks out there, you will find no better device that has long battery life with one charging! And having a thin and light laptop is just incredible. Using an Air is like using your iPhone, you charge while you are sleeping, and using your laptop during the day time, all day. This Apple MacBook Air MJVE2LL/A model is light, portable and very sleek, it’s what you expect on a light laptop. Comparing to Macbook Pro’s price, it is more affordable, and it has better battery life. For most people that will do computing tasks on a Mac Air, the performance will be more than adequate. For gaming, the HD6000 GPU and Intel Core i5 will work surprisingly good. For movies, music, browsing web, and running iLife apps, it will run very smooth and quick. With a Mac, you will be amazed with startup and shutdown time, as it’s very quick and snappy. The keyboard and trackpad on a Mac are the best that I have ever used in a portable laptop. Keys are nice and fast to type on and so accurate. The trackpad has a kind of glass surface, large to move and it has lots of practical and useful gestures, just like having a touchscreen, it’s just a joy to use. I find the 1 year standard Apple warranty is the best warranty in the market. Other laptop brands will give you a half month store warranty, and any issues you will find in the next months, you will have to need a RMA, and sending your device to your manufacturer than can take likely a month, and will be on hold for long periods of warranty validation process. You just can go to your local AppleStore and you will be surprised how good the support is. Not everything is perfect though. I find two caveats on this Apple MacBook Air MJVE2LL. A small one and big one. A little caveat is the screen, it is not a retina display. People will say, that they don’t understand why Apple doesn’t include a retina display on 13 inch Macbook Air, because it’s technically better in resolution, contrast, and color, etc. But to me, on a 13 inch screen, those super resolution is just too high for my eyes, it would be so difficult to read your small texts on it, can you imagine how you can read an ultra full HD resolution stuff on your phone? This is something that you need to consider before choosing a retina display. If you have a 15 inch Apple laptop, then it’s different, because a 15 inch is the actual size, but for a 13 inch, I definitely don’t want a retina display on it. The major caveat, its RAM is not upgradeable because it is soldered to its motherboard. This MacBook Air MJVE2LL has 128GB PCI-e based flash drive, 4GB of RAM, and if you want to have more RAM you will not be able to upgrade it. However as mentioned, as a light and on the go device, you are not supposed to run any richer resources jobs, like daily video and image editing or gaming. This is something I love about Macbooks, out of the box, they are good to go. No need to uninstall bloatware to free more space. No bios to worry about, no anti virus needed, no blue screens of death and you won’t need to download and install tons of updates to patch the security of the OS. Mac OS X is more stable and solid, it’s Unix based. Macbook Air 2015 or 2014? Another question that you might ask? is it worth to get a 2015 MacBook Air instead of 2014 model? It depends on what you need, if you need faster read and writing speed on your flash storage, enhanced faster CPU and updated graphic cards for about $100 more, then yes, it’s worth it. With 100 bucks more, 2015 vs 2014 Macbook Air comparison. So basically, this Apple MacBook Air MJVE2LL/A is beautiful and light, yet powerful to be on-the-go laptop. If you are looking for a Mac laptop that is perfect to be on the go device, and has best values, then this MJVE2LL should be your first consideration. ← Previous: Which One To Choose MacBook Pro 128 or 256 GB SSD?